Just wondering, since I do a lot of link-sharing and occasional commentary that fits multiple social networks. If you’re following someone on more than one network, and they post the same thing to both, would you rather get it out of the way all at once, or see it staggered over time? Also, assume the cross-post is properly tailored for each network, so you don’t have #hashtags on the Facebook post, the Twitter post doesn’t link to a Facebook status, links on Google+ and Facebook have previews, etc. This entry was posted in Off-Topic, Timely and tagged Polls, Social Networking on September 9, 2011 by Kelson. Interesting question. I post all my notices at once, and I think that works (as the blogger, not the reader) because traffic comes in from the different places simultaneously — that is, I sense there’s different people on Twitter than on Facebook, for instance, and each wants their notifications in their respective places but at the same time. 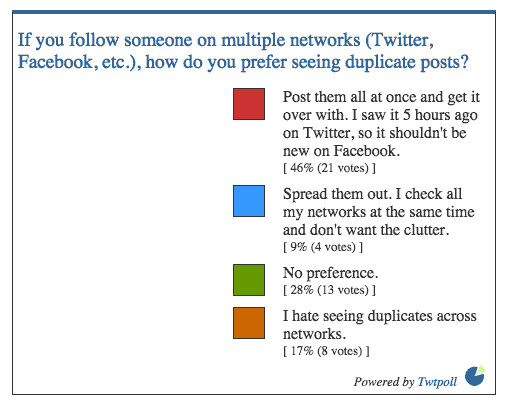 Put another way, I think the “don’t want to see duplicates” population will be small (though maybe your poll will prove me wrong) because readers are looking for different things in different places. I usually catch Speed Force on an RSS feed or on Twitter, for instance, whereas I mostly get Comic Book Resources by direct visit. Yeah, I usually post things simultaneously (sometimes because I’m in a hurry and just send it to ping.fm, though that sacrifices the tailoring aspect). A couple of things got me thinking about this, though. A few weeks ago, I read a Google+ conversation with someone who had managed to link up Facebook, Twitter and Google+ so that he could post one status to all three networks at once. Some of the people involved were of the opinion that it was a bad idea to begin with, since not everything really applies to all social networks, and then the question of timing came up for those statuses that did apply. More recently, I read about a study by bit.ly that found that half of the clicks a given link receives on Facebook, Twitter, or IM are made within the first three hours. This fits nicely with the conventional wisdom that you should post links on Twitter twice to catch people who read at different times, like an east coast and west coast feed. Spreading the posts out over time keeps the link or the idea out there longer. So from the author’s point of view, there may be a case for staggering updates, depending on how much the audiences overlap and when they read. I figure the reader’s point of view is going to vary more. And I agree that the “I hate duplicates” group is likely to be small, but I figured it would be dishonest to leave out one of the logical options. i voted that last option, but then theres only been a few people i follow on everything they do, and then they have all their posts automatically back to their facebook page… which was overkill and i just stopped following altogether. then again, i get my updates for here either by visiting or checking facebook a couple times a day. I have no issues with how you have been posting so, whatever you’re doing, keep it up.